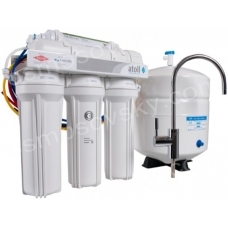 The system of premium on a recognized leader in the field of filtration by reverse osmosis. Reliable bulb, the best filter media and the membrane, modern drinking faucet, perfect "white" assembly. · Storage tank: 12 l.
· Operating water pressure: 2.8 - 6.0 atm. The process of complete cleaning of water filter reverse osmosis Atoll A 560Em place in several stages. With the help of expanded polypropylene cartridge is irreversibly retained mechanical impurities larger than 5 microns. Cartridge with high quality granulated carbon Pentek UDF-10STD adsorbs chlorine, organochlorine compounds, removes dissolved gaseous impurities. The polypropylene cartridge with a rating of 1 micron filter catches the smallest coal dust from the previous cartridge trimmed water from the remaining solids before being fed to the membrane element. The main element of a reverse osmosis system Atoll A-560Em (A-550m STD) is a reverse osmosis membrane Filmtec TW30-1812-50. At this stage, the separation of water molecules from all dissolved impurities, including various organics, and other hardness salts. Linear cartridge with high quality activated carbon from coconut shells and a set of minerals - postfilter Pentek GS-10 CAL / RO - corrects the taste and smell of water and minerals are added to the feed in drinking faucet. The performance of reverse osmosis filter is small - 50 - 150 grams of pure water per minute. Therefore, the system automatically collects the purified water in a water-air tank; when you open the tap drinking Hi-Tech (Modern), a large, crystal clear water is already supplied with an acceptable rate of 1.5 - 2.5 liters per minute. The amount of purified water in the tank can reach 10 liters. Reverse osmosis system Atoll A 560Em automatically turns on and restock water at every faucet Water consumption from drinking. The reverse osmosis filter Atoll A-560Em (A-550m STD) used impeccably high-quality components from leading manufacturers. Fully "white" assembly, strict quality control at each stage of production and assembly of the filter, top of the range system with everything necessary for a successful installation and operation deservedly provide Atoll A-560Em (A-550m STD) reputation as one of the world's best systems of reverse osmosis; It is one of the world's most popular models. Buy a reverse osmosis filter Atoll A-560Em (A-550m STD), you can place your order on our website or contact us in any convenient way for you. Standard size cartridges slim 10"